It's that time of the month again when my favourite little brown box from Lucky Dip Club made its way through my letter box and this month's 'Biscuits' theme was definitely one to love for fellow sweet tooth addicts like myself! I think it's fair to say that I am never disappointed with the Lucky Dip Club contents and this month was no exception. My favourite item from this box would have to be the DIY mini biscuit cushion as I really do love a little creative challenge! The last DIY project we received a few months ago involved making a crochet jellyfish which, for a beginner like myself, was quite difficult but it also got me hooked on crochet. I was relieved to see that this DIY kit was more straight forward! Well that's what I thought at first anyway and having not hand sewn anything for years I think I may have been a tad optimistic in my abilities because my mini cushion didn't turn out as perfect as i'd hoped. I was also really pleased to see that Party Ring's took centre stage with this box as they are indeed vegan friendly! You might be surprised to hear that there are actually quite a few 'accidentally vegan' biscuits in the shops including Lotus Biscoff caramelised biscuits, Jammie Dodgers, Bourbons, Crawford's Pink Wafers and of course one of my personal favourites - Oreo's! I really love the collaborations in this month's box too with my new favourite Caboodle Magazine taking over the monthly zine. I really adore this magazine as it just seems to incorporate everything that i'm passionate about from arts & crafts to beauty, interiors and travel. They even had a vegan recipe in the last issue! I've also been following Nikki McWilliams work on Instagram for some time now so it was really exciting to hear that she was going to be designing items for this box. Her biscuit cushions are really adorable and definitely one to add to your Christmas lists. 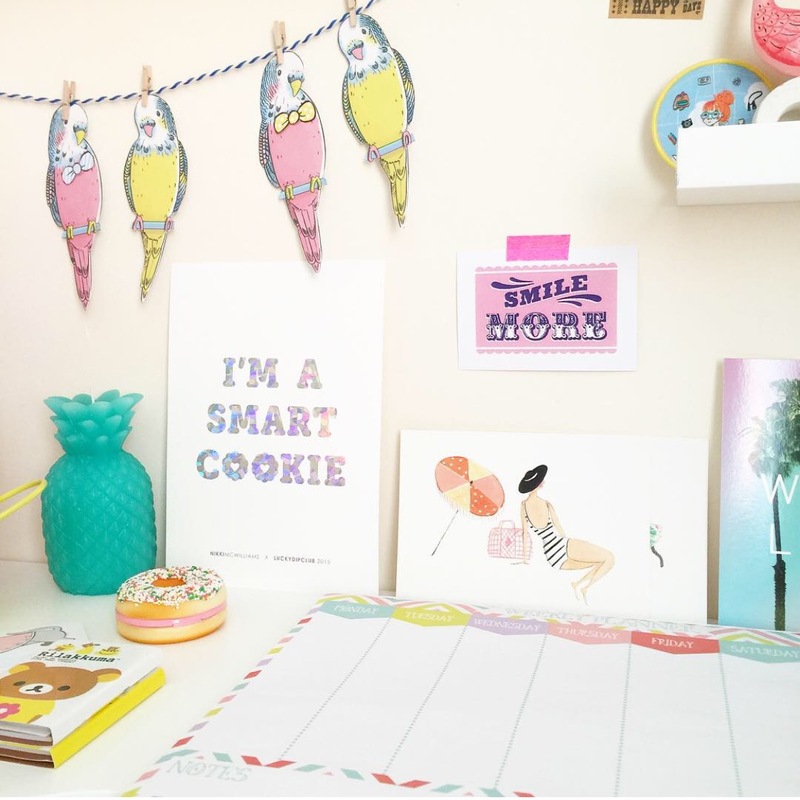 Her 'I'm A Smart Cookie' wall art has taken pride of place on my desk which is at the moment being over run with all my Lucky Dip Club goodies! It was also really nice to see someone who i've followed for a long time now, Lily Von Cupcake, design the biscuits illustration (top photo). I love her style and her regular pet pics making her Instagram one of my favourites of the moment. The next Lucky Dip Club 'Space Girl' box launches on the first of the month at 7:00am so be sure to set your alarms if you want to be in with a chance of securing yourself a one off box or a subscription. Right, it's time for a tea & biscuit break! How do you dunk yours? Oh wow these confectionery manufacturers seem quite intriguing. I love your blog post Sarah and I am sure your DIY biscuit cushion has turned out to be pretty excellent. Can’t wait to get a box for myself!